I love, love, love this jacket. I can't wait for it to cool off a little around here so I can wear this one. I didn't completely follow Burda's instructions. I would type my own instructions out for you... but I'm too lazy! So if you have any questions on construction let me know! Changing the subject- I've been on a mission to bust my fabric stash before making any other fabric purchases. And after reading some of your blogs, I know some of you are doing the same. It's been tough but I have not bought any new fabric since the beginning of the year. I started at 42 pieces of unused fabric. Now I am down to... 21! Once I get down to the single digits... it's off to the fabric store I go! 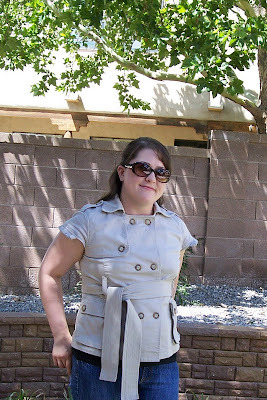 Pattern Description: "Sturdy canvas and double-breasted fastening on the one hand, romantic cap sleeves with pleated ruffles on the other: this jacket is a great example of style mixing! A wide, self-fabric belt tied at the side cinches the trendy jacket to fit your figure." 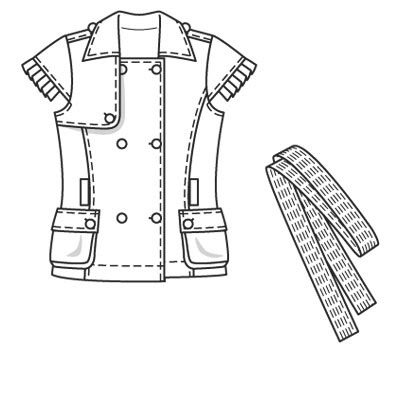 Pattern Sizing: This comes in petite sizes 17-21. I made the 21. Were the instructions easy to follow? For Burda instructions, they weren't hideous. However, once I got to the attaching of the facings and collar, I went off on my own. I used other resources such as my Vogue Sewing book and Big 4 pattern instructions to complete the parts I got stumped at. Although there are quite a few details to the jacket, it really isn't difficult to sew... just tedious. What did you particularly like or dislike about the pattern? I've admired this jacket ever since I got this issue. This is my first Burda issue that I received! 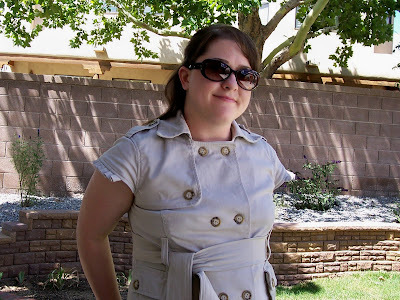 I like the mix of safari details with the ruffles on the sleeves. I was intimidated by the bellows pockets but they really weren't too difficult to sew. Fabric Used: I used a stretch cotton twill. It's been in my stash for quite some time and I can't remember where I got it or for how much. Pattern alterations or any design changes you made: I didn't make any changes. Luckily, I am somewhere in between a petite and regular size so can get away with the petites without making changes. If you are of taller stature, I think this would be pretty easy to alter. Would you sew it again? Would you recommend it to others? This is such a unique jacket that I probably won't sew it again. I would recommend it to others though. Conclusion: This might be my favorite jacket that I have made so far! It's very unique. It will look great in fall/winter with a long sleeve tee underneath. 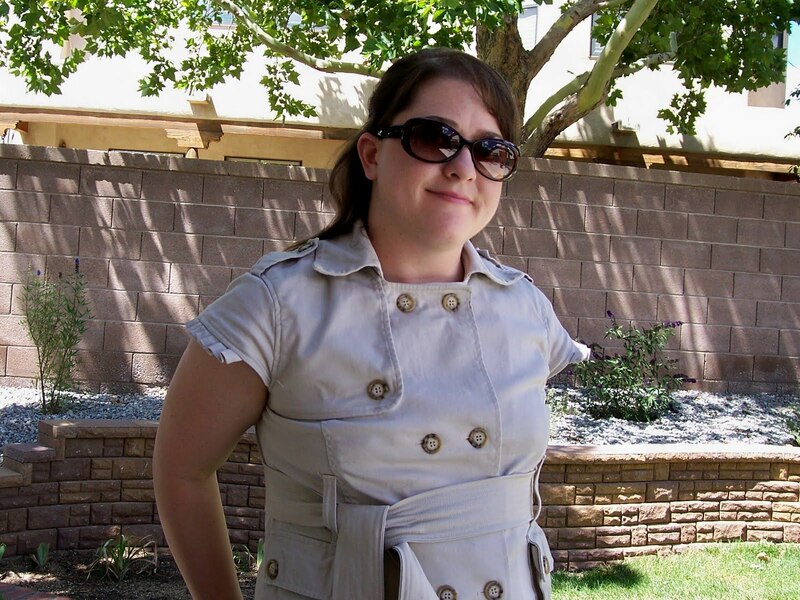 Very nice jacket, great job! Wow, this jacket looks store bought! You did an awesome job, and yes I will be stalking you for help, I love this jacket too! Ooo.. I can see why you love this jacket! Super cute! I wish I started by Burda collection in 2008! Awesome job of the jacket. The pleated sleeve hem is perfect. Wow thats so awesome!! You did a fantastic job!! So much detail in it as well I would be a bit worried to start this one with the Burda Instructions lol. Great you worked it out.